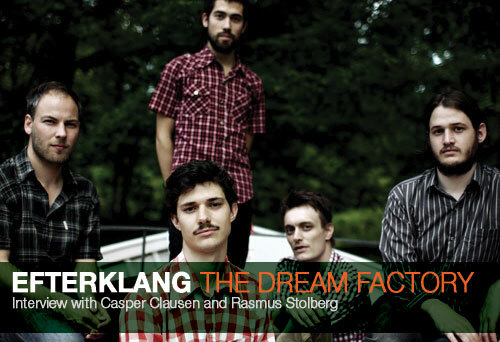 A little over three years ago, a formation answering to the mysterious name of Efterklang and hailing from Denmark appeared with their debut album, Tripper, and rapidly gathered critical acclaim and respect. The re-release of the band’s debut EP, Springer, originally released in 2003, a year before the album, and a limited edition one-sided LP, confirmed the band as one of the most interesting acts to have come out of Denmark. Following the release of the superb Under Giant Trees EP earlier this year, Efterklang return with their second album, Parades, on which they have developed an entirely new approach, more focused on acoustic instrumentation. In this interview, Casper Clausen and Rasmus Stolberg talk about what influences them, how their new album came to life, running their own record label and playing live is like playing football. You formed Efterklang in 2001. How did you all meet and how did the idea of forming the band come up? Mads & Rasmus know each other from kindergarten and have played in bands together since fifth grade. In high school they befriended Casper and started playing together with him as well. After a couple of years their small hometown/island in the countryside felt too small and without much planning it was decided to move to Copenhagen the capital… We searched for musicians and through friends we met Thomas and Rune in December 2000. That was the start of Efterklang. All five of us spend years rehearsing and writing together until we felt ready to share the music with others. This was more than two years later. We had no specific “idea” about the band before we started. The only thing we cared about was the wish to try to make music we could call our own. We would try to explain that the music is experimental and very multi layered with a vast number of different instruments, but also very accessible and melodic. We think our music has romantic tendencies and is a sort of adventurous eccentric pop music. Who has influenced you in your work? In recent years it has been Spirit Of Eden by Talk Talk, Scott Walker, Animal Collective, Sufjan Stevens, Clogs, Popul Vuh, Einstürzende Neubauten, Arvo Pärt, Xiu Xiu, Moondog, Joe Meek and many other great musicians and artists. Filmmakers like Werner Herzog, Ingmar Bergman and David Lynch and The Brothers Quay also keep inspiring us. Your first album was very well received both by the press and by the public. How did you react to the reception your music received? At that time we did not know what to expect. We all felt we had made a good album, but we were quite awestruck by the reaction we received. It was a nice thing to experience. Earlier on this year, you released a mini album, Under Giant Trees, which was conceived and recorded while you were touring. Does it mean that it was a very different record from the others for you? Yes the songs were written as an eight-piece live band and debuted on stage. The way we have made Parades is different in the way that we have not been able to play them as a band at anytime during the recordings. Right now we are learning to play them as a live band. We like both of these ways of making music. Your new album, Parades, is out pretty soon. Your sound has evolved quite a bit from Tripper, on which you used a fair bit of electronics, to now where the focus is much more on acoustic instruments. Can you tell us how you worked on the album, and whether the recording process was very different from Tripper? You’ve worked with a lot of people over eighteen months for the new album. How do you keep track of what you want to achieve? Part of it are dreams that come true about having a string quartet and a choir recorded in a church for example, part of it is trial and error. A lot is well planned and recorded after quite a detailed plan. There is a very dreamy feel to the whole album, with very rich soundscapes and multiple vocal and melodic layers pretty much all the way through. What did you have in mind when you started working on the album, and is the result close to this or did you find that you went in directions you hadn’t expected? The album pretty much took its form along on the way. It started out being small sketches and ideas on our computer. We started adding new pieces to these loose ideas or simply combined some of them to one structure. After a period of messing around with all sorts of combinations and experiments, it felt like some sort of an image was appearing. Kind of like putting a grand puzzle together, while at the same time not knowing what the finished result would look like. I mean we expected making something like this album turned out, but we didn’t have a clear vision when we started. How do you work on new compositions? Do you have a set way of working, and is this usually a collective process? It is mainly Mads and Casper who compose the songs, but these compositions are usually based on recordings that all members take part in. For instance this could be a song build on a piano piece/idea by Rune or simply a few of us playing around with some instruments while the tape is running. While the songs are progressing we all take part in brainstorming ideas and playing the additional instruments. Danish artist Nan Na Hvass created the artwork for both Under Giant Trees and Parades. How did you come across her work and how did you decide to get her to do these covers? Nan Na and Rasmus meet each other at a party about three years ago. Nan Na thought Efterklang was an a cappella boys choir when Rasmus bragged about it. They have been together ever since and this is the way we came across her work. She has taken our press-photos over the last years, she has designed Rumraket.net for us and most important these two fantastic sleeves. We wanted something imaginative and layered that would send a message about the many hours, and thoughts that have gone into making this music. Nan Na succeeded in making the artwork beautiful, magic and dense at the same time. Your first EP was released in 2003 on Rumraket, your record label, before being picked up by Leaf. Did you originally set up the label to make it easier to release your music or did you already have the intention to promote other artists? No plans in the beginning. In fact we invented Rumraket to make Springer look more important. We made the 500 copies to sell to friends mainly and to send to record labels and concert promoters – we had the impression it would look more professional if there was a label name on the disc. Later on a lot of plans emerged! How did you get involved with Leaf? While we were making Tripper we posted out work in progress and rough-cuts to a select group of labels. Leaf got in touch just as we were about to release it on Rumraket. There was a lot of trouble with getting them to Denmark to see us perform live. It never happened actually but Robin Rimbaud (AKA Scanner) saw us and gave his stamp of approval to Leaf. You also take care of the management of the band’s career yourselves. Is it important for you to retain as much control over the band as possible and why? We have often been described as control-freaks in regards to the music we make. Perhaps this also goes for all the things around the music. The main reason that we take care of our own business is because we have a member who enjoys doing this and who is as good as most professional managers and such people. The mini album you released on Leaf earlier this year, Under Giant Trees, was a limited release, and you also released a very limited one sided LP on Burnt Toast Vinyl. Why did you choose to limit the number of copies for these? It is nice to make special limited editions. It makes it possible to do special things with artwork and such. We used to make handmade covers for our old records. We would love to start doing that again – it is a question of having the time to do it. When a release is limited it also makes the whole thing feel more as a nice gem or something. Through Rumraket, you regularly release records by new artists. You released the first Grizzly Bear album for instance, and in recent months, records from Slaraffenland, Swedish sisters Taxi Taxi! and now American musician Canon Blue. How do you choose to release an artist, and are you all involved in the running of the label? It is primarily Rasmus who is in charge of the actual running of the label. We all discuss the music and we all have to agree on the artists we sign. We found Canon Blue on MySpace same thing goes with Taxi Taxi! Erik Levander and Slaraffenland are our friends in Copenhagen, and they happen to make some of our favorite music. Grizzly Bear emailed us a long time ago and asked for a remix. We agreed to do it and asked if we could release their album in Europe in return. How did you react when Grizzly Bear signed to Warp? When they signed with Warp we were quite proud. It was sort of a proof for us that we have good ears. One of the tracks from Tripper, Collecting Shields, was recently included on a compilation CD put together by author John Connolly, accompanying his most recent book, The Unquiet. The CD collects songs that played a role in the book or inspired him to write. What did you think of the project, and have you read the book? Did you feel a connection with your music? Would you consider working on a soundtrack, and what kind of films would you like to score? Mads and Casper have already scored a Danish animation feature by Anders Morgenthaler and we hope to be able to work on projects like that again. If any directors are reading this then please get in touch! You have toured quite regularly since the release of Springer and Tripper. Do you enjoy playing live more than recording? The way we record and play live is very different. We enjoy both forms. One thing, which is nice about playing live, is the feeling of playing a song together, eight people as one big united creature. Our recordings are often much more fragmented and are more like trying to finish a very confusing computer game. You are not sure where you are going and you have to invent things and solutions along the way to succeed. Playing live is like playing football together. You are just about to embark on quite a long tour to support the release of Parades, and you will be joined by three additional musicians on stage. What can we expect of Efterklang live this time round? It is actually four extra musicians this time. We have expanded. One thing to look forward to is that we now can perform our choir arrangements live. We have 6 gifted singers in the band now and one is a girl so we can finally also do the male/female vocals that can be heard on our records. The new live show is more energetic, raw and sometimes quite rocking in our own way of course. We won’t bring visuals this time (at least not for the first part of the tour), which means we will be performing more this time. No shoegazing. How do you think Efterklang will continue to evolve? Do you already have an idea of which direction you want to go? We are talking about directions or ideas we would like to try-out. But first we need to get some distance with the recording of Parades and also get the tour going before we start thinking of new recordings. Aw, I haven’t heard Parades yet. Looking forward to the concert; in particular those choral arrangements!